The Sony KD 43X8000D 43inch 4K Android TV gives you unbelievable visuals. It is a thin TV with a smart and neat look. Its 43inch screen produces images rich in clarity, vividness, sharpness, and details with 4K picture resolutions. Everything that you view on this Sony 4K Android TV, including broadcasting content, online content, BluRay discs, or content from one of your smart devices, gets displayed in 4K resolution. The colors also look bright and natural because of the TRILUMINOS display. The sound quality of this Sony Android TV is as brilliant as its pictures. It has audio technologies such as ClearAudio plus, Clear Phase, Cinematic S Force Front Surround, and Digital Sound Enhancement Engine technology. These create exceptionally rich and immersive sounds which complement the pictures and enhance your TV viewing experience. 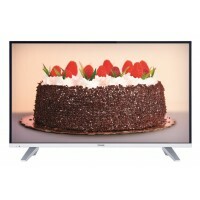 This Sony KD 43X8000D TV is all about your entertainment, and so it is compatible with many smart devices. In addition, this TV also has many built in apps so that you can enjoy content from every source with crystal clear and vivid picture quality.